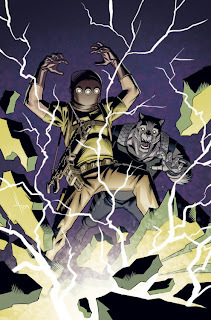 Issue 19 comes out today. This issue is a little bit of a departure from recent issues, and it was a ton of fun to draw. After looking through a copy my son said "daddy, this is the best episode of Wolf-Man you've ever written". So there you have it, a glowing review from a 6 year old. Here is the cover so you know what to look for. 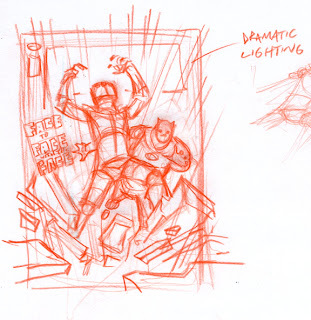 And to show some process stuff, here is the rough sketch for the cover. For those who missed the con in Baltimore last weekend, you missed a great time. What a fun show, tons of cool artists for me to drool over (their work, not them as a person) the show had a great vibe, and seemed pretty busy for everyone. I met tons of Wolf-Man fans, did some sketches and hung out with the rest of the Kirk-crew (Ryan Ottley, Cory Walker & Nate Bellegarde). Thanks to everyone who came by and said hi.